No, not with this little nugget. Although I do love her so. How does she manage to be so cute? So so cute. I am in love with Nigel Slater’s new book, Tender (thanks Mom!). Tender is a whimsical, drooling-inducing tribute to the magnificent and transcendent power of the vegetable. Yes, the vegetable. You’re eyes aren’t deceiving you. In his almost overwhelmingly dense volume (over 500 pages kids) which is as much a pleasure to read as it is to cook from, Slater turns what most Americans consider “side dishes” into the main event of breakfast, lunch and dinner. And trust me, not one of these recipes will leave you struggling to clean your plate. Admittedly, Slater does this most often by enhancing these spuds, buds, stems and stalks with richly flavored ingredients such as bacon drippings, beef drippings, cream, clotted cream, rich cheeses such as goat and brie, baths of olive oil, and of course (he’s British of course) lots of butter. Miraculously, even with all these strong flavors, the vegetables in question – rutabaga, cauliflower, potatoes, squashes, asparagus, tomatoes, brussel sprouts … – still come out being the stars. And while I know I am not the toughest sell when it comes to vegetables (I would eat brussel sprouts every day if they grew year-round and do not come in between me and a basket of fresh tomatoes in August) Slater has me eating even more vegetables! Not only that, but he has me trying new varieties of old favorites and experimenting with his recipes, mixing and matching varieties to suit my taste. 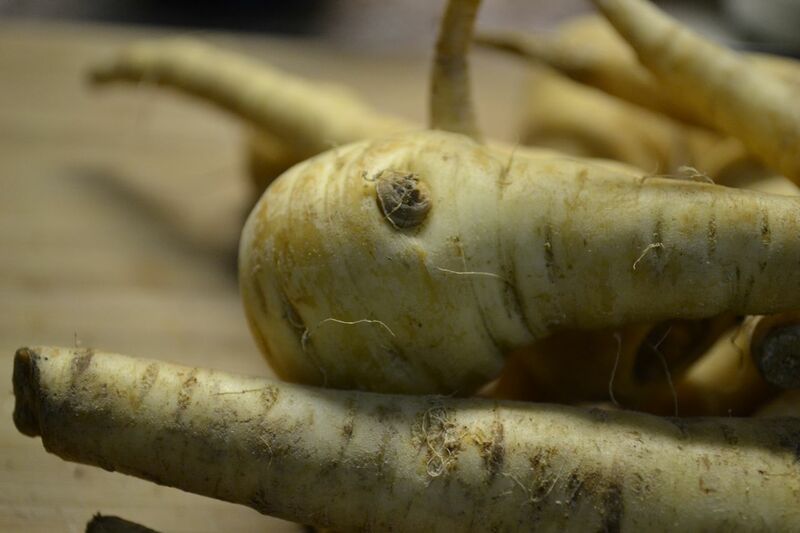 So go ahead, grab that bizarre variety of winter turnip, crack open Tender, and go wild! Enjoy! Adapted from Nigel Slater’s Tender. Active time: 10 minutes, Inactive time: 1 hour; Serves 6. Preheat oven to 400 Fº. Scrub parsnips and remove tops. Slice each in 1/4 inch rounds. 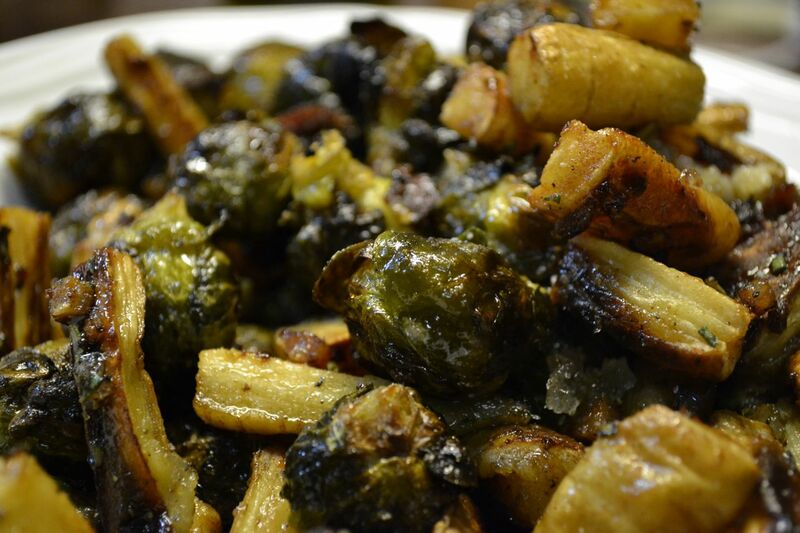 Rinse brussel sprouts and cut in half if they’re large than one inch wide. Put them into a roasting pan with the bacon grease or a thick slice of butter and a spoonful of beef dripping (or butter). 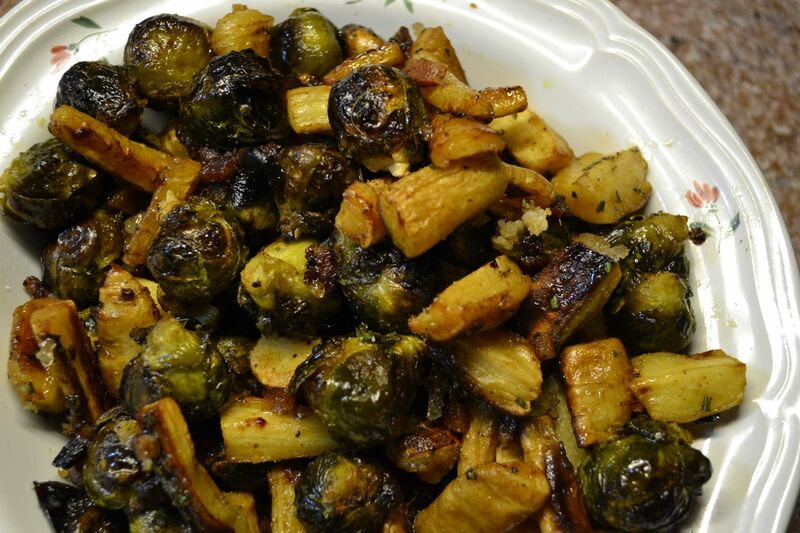 Season with salt and black pepper, then roast for thirty-five to forty minutes, until vegetables are soft and golden. Remove leaves from rosemary sprigs and chop them finely. 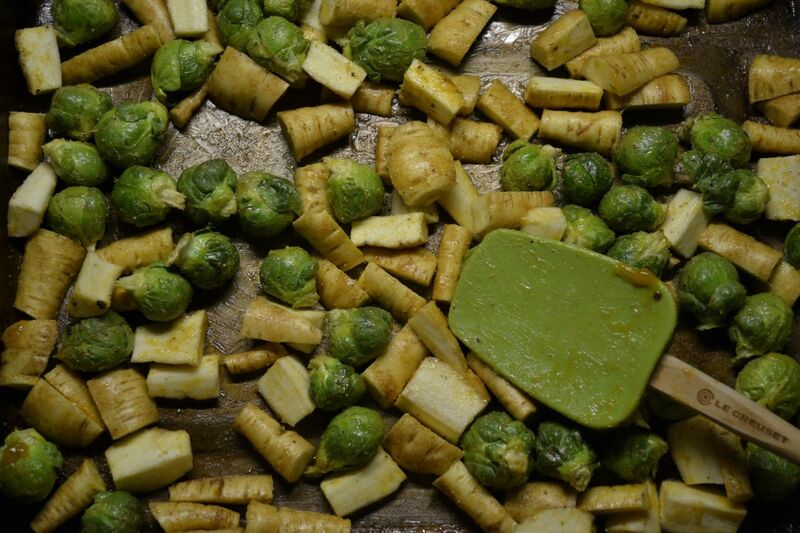 Add them to the vegetables with the maple syrup, turning vegetables over as you go. Continue to roast for twenty minutes or so, until the surface of the vegetables are sticky and golden, the flesh soft and sweetly tender. Enjoy!